Little Angry Gill Floater comes in at 4 1/2 inches and weights 3/4 oz. Walk it over points, flats, brush or next to docks and hold on. Little Angry Gill Floater comes in at 4 1/2 inches and weights 3/4 oz. Walk it over points, flats, brush or next to docks and hold on. Look cool and feel good on the water this summer and Fall with Tater's New Long Sleeve UV 40+ Shirts COLOR: SPORT GRAPHITE 100% polyester interlock with moister-wicking and UV protection performance. Med,L,XL,2XL,3XL available. Look cool and feel good on the water this summer and Fall with Tater's New Long Sleeve UV 40+ Shirts COLOR: SPORT GRAPHITE 100% polyester interlock with moister-wicking and UV protection performance. Med,L,XL,2XL,3XL available. 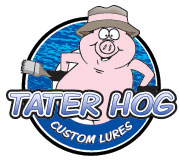 Tater Hog Hat Tater Hog Uncle Ronnie "Blue Back Herring"
The Haymaker Crankbait DD is great for 8 to 10 foot brush, rocks or stumps. It is a old school style hunting crankbait that hunts for big bass. Bait length 2 1/2 inches and features stainless steel hardware and high quality hooks. Weight 1/2 oz for long casts. The Haymaker Crankbait DD is great for 8 to 10 foot brush, rocks or stumps. It is a old school style hunting crankbait that hunts for big bass. Bait length 2 1/2 inches and features stainless steel hardware and high quality hooks. Weight 1/2 oz for long casts. The Haymaker Crankbait SR is great for 3 to 5 foot brush, rip rap rocks or stumps. It is a old school style hunting crankbait that hunts for big bass. Bait length 2 1/2 inches and features stainless steel hardware and high quality hooks. Weight 1/2 oz for long casts. The Haymaker Crankbait SR is great for 3 to 5 foot brush, rip rap rocks or stumps. It is a old school style hunting crankbait that hunts for big bass. Bait length 2 1/2 inches and features stainless steel hardware and high quality hooks. Weight 1/2 oz for long casts. 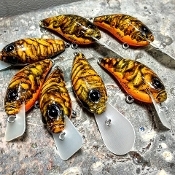 BIG NASTY CRANKBAIT CRAW or SC SUNFISH TATER HOG Hoochie Baby Jointed "WHITE GILL"
TATER HOG Hoochie Baby Jointed "SC SUNFISH" TATER HOG HOOCHIEMOMMA "WHITE GILL"
TATER HOG HOOCHIEMOMMA NATURAL BLUEGILL Tater Hog Moonshiner Wake "Chart Bone"